if you want to work on other operating system , what you are going to do? you will install virtual box or VMware on your machine and you will install next operating system on the virtual environment. Most of the windows users don’t know about windows Hyper-V. It comes with windows 10,windows 8 and 8.1 . ( This feature will not work if you have old hardware components). Sometimes we need to turn off automatic updates because it uses big bandwidth.Limited internet connection owners specially have this problem.This is how we can do it in windows 10. 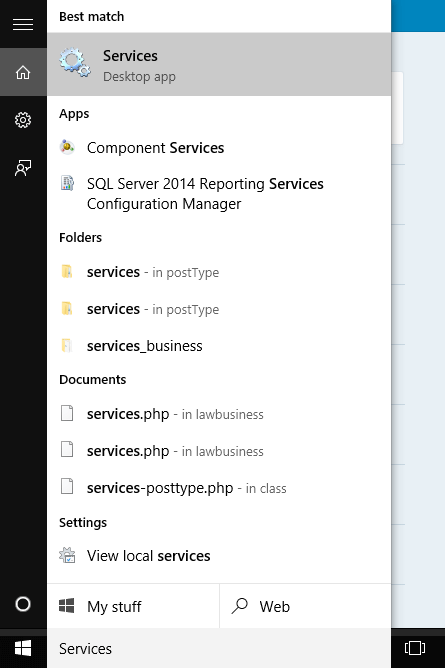 First you have to search for “Services” in windows 10 search box. Welcome everyone for my new technical blog.I’m a blogger since 2010.I’m going to write about my experiences, Projects and Phone apps in this Blog. In my next posts I will share something new regarding programming (because I’m a code lover 😀 ). I think sometimes my posts will helpful for new developers. Please drop a comment if you have any doubt on these topics.